How Do I Get a Golf Swing Rhythm Back? Swing rhythm creates fluidity and a better golf swing. As you progress in the game of golf, you should develop a rhythm for your swing. Basically, rhythm in the golf swing is the ability to get all the physical components of your body working together in your swing. A good rhythm makes a golf swing look effortless. Regardless of your swing speed, as long as your rhythm is solid, your swing will look and feel effortless. An important thing to recognize is feeling the force, not forcing the feel. Take your normal approach to the ball. Start humming while you hit the ball. A good rhythm is all about fluidity and consistency of motion. Having something in your head that's easy to remember, without having to think about the swing itself, will establish a rhythm. If you are going to hum, make sure that your hum remains consistent in speed and volume throughout. Look for places in your swing where your humming changes. If you humming becomes louder at certain points, you are trying to hit the ball too hard. If your humming stops, this may indicate a point of tension in your swing. If your humming decreases just before impact, you are slowing down your swing and, most likely, slicing the ball. 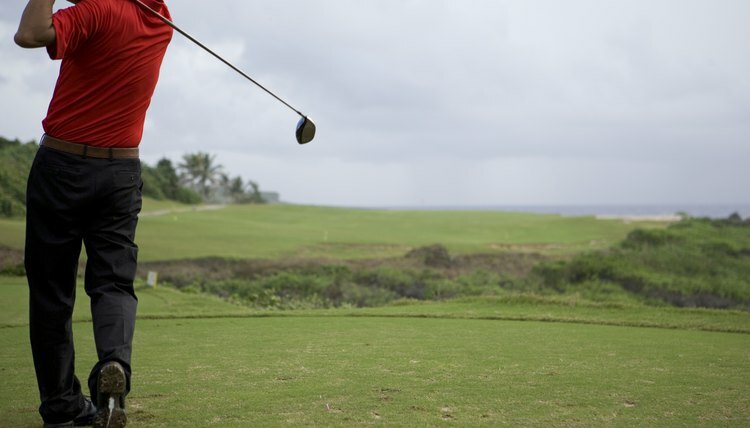 Practice humming over and over while you hit until you start to feel the fluidity of the swing. Address the ball as you normally would. Identify the parts of your swing. One could be your take away, two the top, three at impact and four on the follow through. Establish a verbal or mental cadence for each part of your swing. This is really dependent upon your particular swing and finding something that fits your swing is key. Try your cadence out as you swing. Practice it over and over until you feel the natural fluidity in your swing return. Which Muscles are Used in the Golf Swing?